This walk takes you past many of the classic university sites of the city, but also to places that you will never have seen before, even if you live here or studied here. In half a day you will feel like much more than just a tourist! 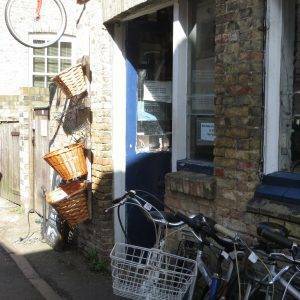 Start & Finish: Grantchester Tea Rooms (CB3 9ND). You can also quite easily start the walk from the railway station (CB1 2JW). Proceed down Station Rd and enter the Botanical Garden (entrance fee) from the Hills Rd entrance. 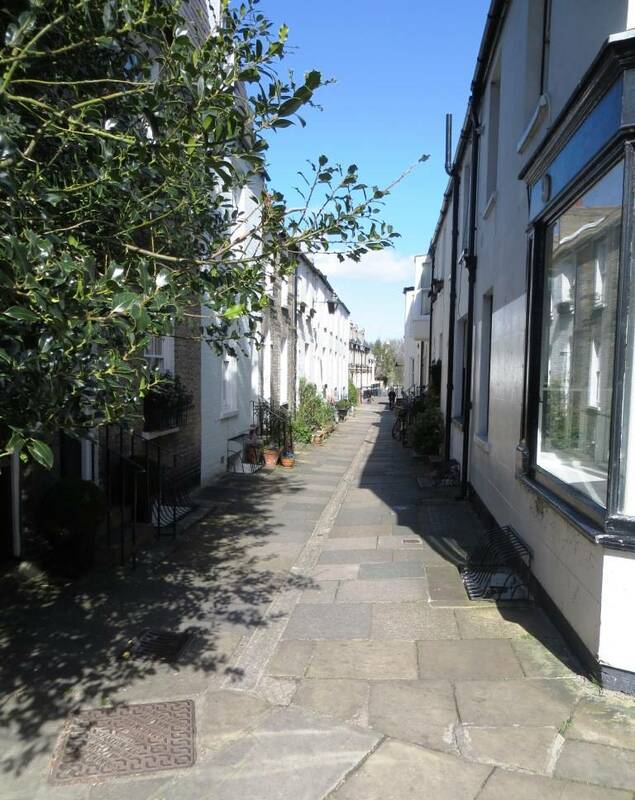 Terrain: flat, easy going; suitable for energetic families; the distance could be reduced by a third by cutting out Steps 5-10 and returning via Parker’s Piece and the centre of town (a chance for some shopping perhaps), rejoining the route at Silver St Bridge and then re-tracing your steps. City status: 1951, granted for exceptional reasons as the only ancient seat of learning in the kingdom not a city or royal burgh; and to coincide with the 750th anniversary of the borough’s first charter of incorporation. 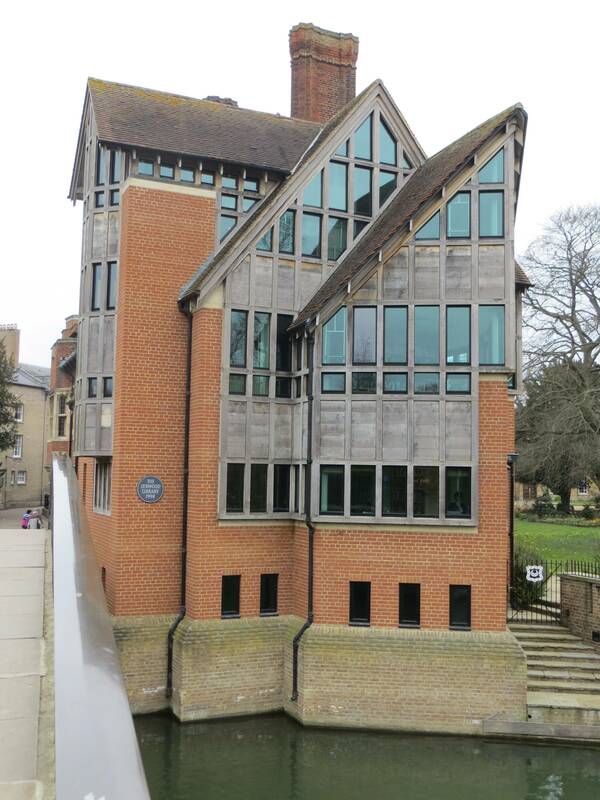 Number of listed buildings: 825, of which 67 are Grade I and 47 Grade II*. Cambridge is a city still defined by academia. The most prominent (if plain) building remains Gilbert Scott’s 1930s University Library, only 157 feet in height but which can be seen from miles around; for this is a very flat landscape, ideal for cyclists who you will encounter around every corner, often heading straight for you! The dominance of the colleges in the landscape has meant a city grid that is skewed, with almost all of the 19th-century development taking place to the east of the city away from the colleges. The railway station was also relegated to the south-east edge of the city, apparently to discourage undergraduates from hopping on the train down to London and neglecting their studies (as if they wouldn’t neglect them in situ). 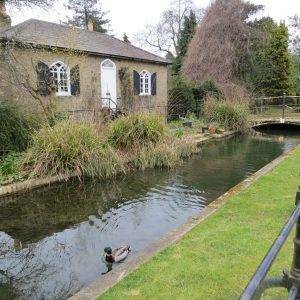 However, the huge benefit of this tight collegiate land ownership has been the large green open spaces that have remained intact, along the Backs, the river to Grantchester and also the numerous sports fields dotted across the city. 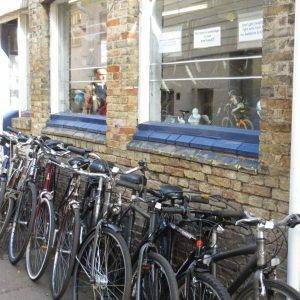 The other very noticeable feature of Cambridge has been its pedestrian and cyclist-friendly policies. The city centre has been barred to traffic for many years and is consequently a delightful space to wander through, full of interesting shops and cafés. Park & Rides dotted around the edge of the city have captured much of the traffic, and the recent innovation of the Guided Busway (which we pass on the walk) is yet another useful innovation. What better place to start a Cambridge walk than at the Grantchester Tea Rooms, which proudly make the Carlsberg-like claim that “more famous people have taken tea here than anywhere else in the world”. We peeped into The Orchard on our way to the river, half-expecting to see a group of academics in earnest conversation in old green deckchairs, with ancient bikes propped against the apple trees and a fair sprinkling of beards, sandals and eccentricities; and that is exactly what we did see. If we had passed through a century or so ago, we might well have witnessed a very similar-looking gathering, the ‘Grantchester Group’ as they were known, comprising Rupert Booke, EM Forster, Virginia Woolf, Bertrand Russell, Augustus John, Maynard Keynes and Ludwig Wittgenstein. They spent their days in animated discourse and enjoying the nature around them (‘in Arcadia’, as Brooke described it). Today, although the conversationalists are not perhaps yet world-famous, the exciting intellectual buzz of debate and discovery was certainly alive and well under the apple boughs. As we headed across the meadow towards the Cam, a wedding party was just getting into full swing. A marquee had been erected alongside the river, jazz wafted across the meads and guests were arriving by punts from the city, propelled along the river by cash-strapped undergraduates and handsome East Europeans, navigating the crafts whilst somehow at the same time managing to serve up champagne & strawberries and telling tall tales about misadventures on the river. 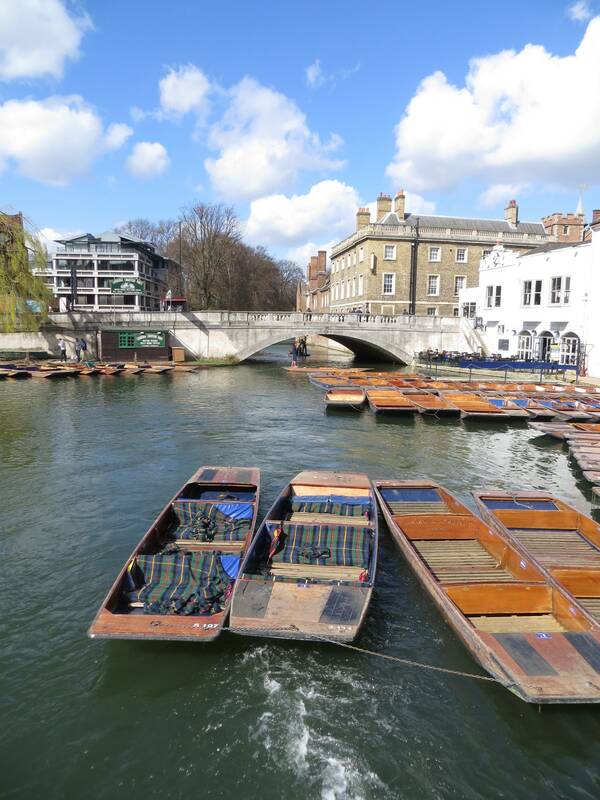 Some punts looked full of academic-types, some looked distinctly well, hip and internet-savvy, reflecting the two sides of modern Cambridge. 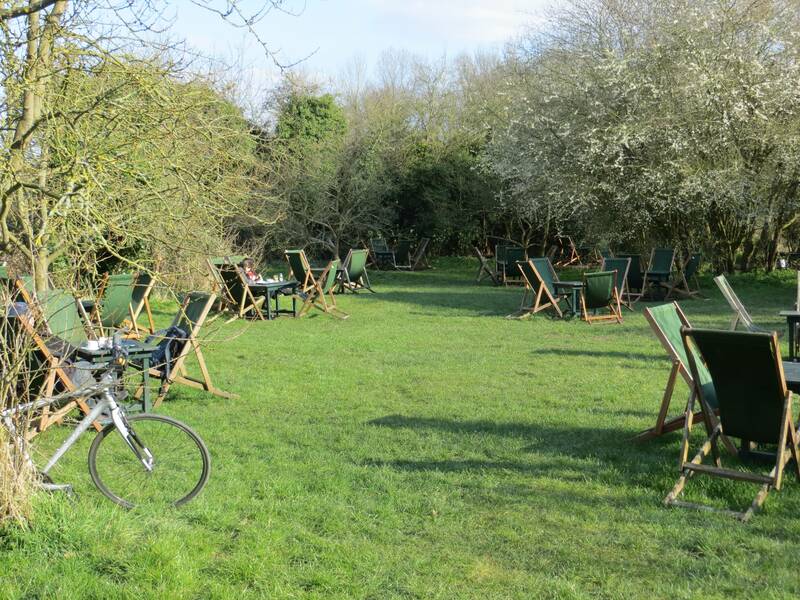 This stretch along Grantchester Meadows (40 hectares, 99 acres) is a glorious way to arrive in the city on foot. As a pair of geese took off honking from the river, my walking companion Mark (who is a music buff as well as an ornithologist) reminded me that Pink Floyd band member David Gilmour had lived here at the end of the 60s, and this stretch of river had been the inspiration for the song ‘Grantchester Meadows’, starring a honking goose and a skylark. The lyrics describe a pastoral and dream-like scene on the Meadows, which is exactly how we felt on this beautiful early summer’s day. This was also a favourite spot of Ted Hughes and Sylvia Plath, who would wander here together at unusual hours. She wrote in a letter to her mother: “Got up at 4.30 a.m. this day with Ted and went for a long walk to Grantchester. I felt a peace and joy in the most beautiful world with animals and birds. We began mooing at a pasture of cows, and they all looked up, and as if hypnotised, began to follow us in a crowd of about twenty across the pasture to a wooden stile, staring fascinated. I stood on the stile and, in a resonant voice, recited all I knew of Chaucer’s Canterbury Tales for about twenty minutes. I never had such an intelligent, fascinated audience”. The cows we passed seemed more indifferent to us, but perhaps by now they have become inured to the English literary canon. 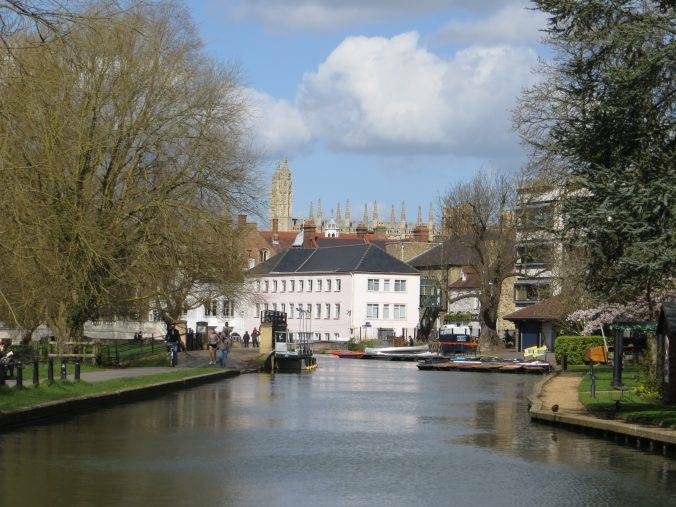 The river path soon brings you out on Silver St; as we crossed, we noted the Mathematical Bridge on our right, designed by William Etheridge in 1749. Although it appears to be an arch, it is composed entirely of straight timbers built to a sophisticated engineering design. A popular fable is that the bridge was designed and built by Sir Isaac Newton without the use of nuts or bolts. Various stories relate how at some point in the past students had attempted to take the bridge apart and put it back together, but were unable to work out how to hold the structure together, and were obliged to resort to adding nuts and bolts. In reality, when it was first built, iron spikes were driven into the joints from the outer side, where they could not be seen from the inside of the parapets, explaining why bolts were thought to be an addition to the original. And nor can Newton have been directly involved, since he died in 1727, twenty-two years before the bridge was constructed. Sorry. 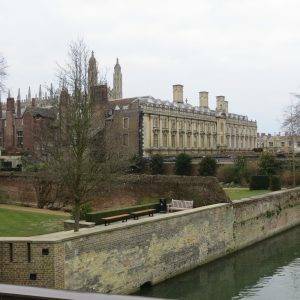 The next stretch of the walk takes us along the Backs to the finest view in Cambridge, King’s Chapel and Clare College – gazing across the Cam and a meadow with sheep grazing in it. Truly a ‘rus in urbe’ experience. King’s Chapel, made famous the world over by the Christmas carols that are broadcast on the BBC every year, dates back to the 15th century and is one of the finest examples of late Perpendicular Gothic English architecture in the country. The route then winds its way up Garret Hostel Lane, but here we took a little detour though my old college, Trinity and its Great Court. Trinity Great Court is one of the largest fully enclosed green spaces in the land and dates back to the 1600s. Sir Isaac Newton really did have his rooms here (this at least is not a fable), as did Lord Byron, who purportedly shared them with a pet bear. 16 porters patrol the college, and their dress and demeanour are unchanged (in my mind at least) since time began. They tend only to restrain and retrain visitors when absolutely necessary, but woe betides anyone that doesn’t quickly understand the rules of the court. No-one may walk on the grass (but of course nothing as tacky as a ‘Do not walk on the grass sign’ to tell you so) unless, of course, they are a don of the college, in which case sauntering across the grass is very much the thing. And no-one except the Master of the College will walk on the grass leading directly to the Master’s Lodge. So that must be the Master and his family that we see now – Sir Gregory Winter CBE, eminent biochemist, founder of three successful Cambridge biotech companies and a Fellow of the Royal Society. Great Court is also famous for the Great Court Run, which involves attempting to run around Great Court within the time that it takes the College clock to strike the hour of twelve. The course is approximately 370 metres long and the clock takes about 44 seconds. It is traditional for athletically-inclined members of Trinity to attempt the run every year at noon on the day of the Matriculation Dinner. Apparently, in 2007 Sam Dobin, a second-year undergraduate reading Economics, made it round within the sound of the final chime, although fierce debate still persists as to whether it was permissible to transgress from the flagstones onto the cobbles to moderate the sharpness of the corners. 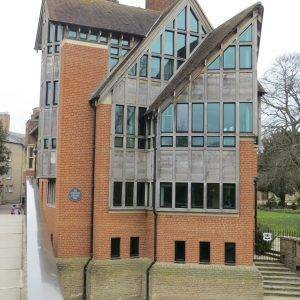 Look up as you pass through the college gates and you will see a statue of the College’s founder, King Henry VIII. Some years ago, his sceptre was replaced with a chair leg as an undergraduate prank. When a bicycle pump was inserted in its place by a subsequent prankster, the authorities determined that the original prank took precedence, and reinstated the chair leg, which is what you will see to this day. Turning left at Trinity Street we soon reached the Round Church, one of the oldest buildings in Cambridge, dating back to 1160. It is one of only four medieval round churches still in use in England, its shape inspired by the rotunda in the church of the Holy Sepulchre in Jerusalem. As we strolled down the charming, flower-bedecked Portugal Street, we spotted a swirly yellow metal sculpture above the door of 19 Portugal Place. 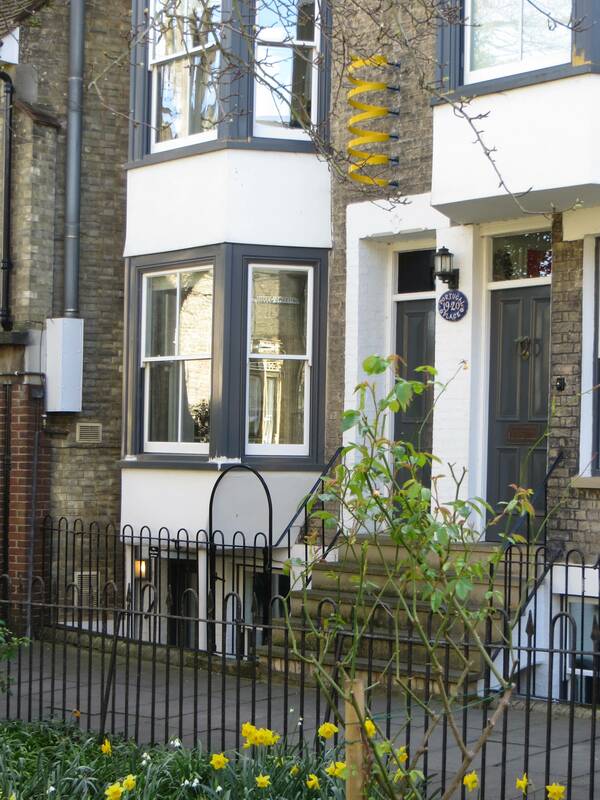 This was where Francis Crick, the co-discoverer of DNA, lived in the 1950s; and the ‘sculpture’ is a representation of a single helix, to commemorate his dwelling there. 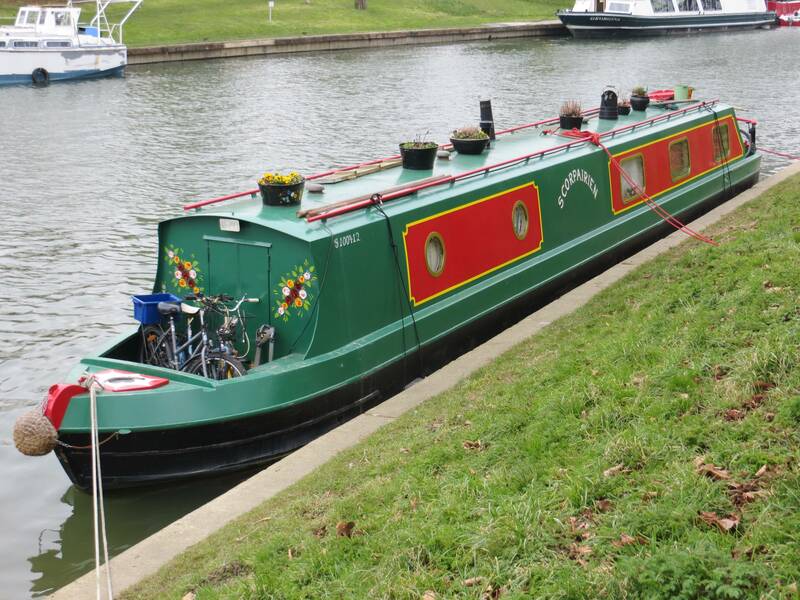 The next part of the walk took us alongside the river across Jesus Green and Midsummer Common. 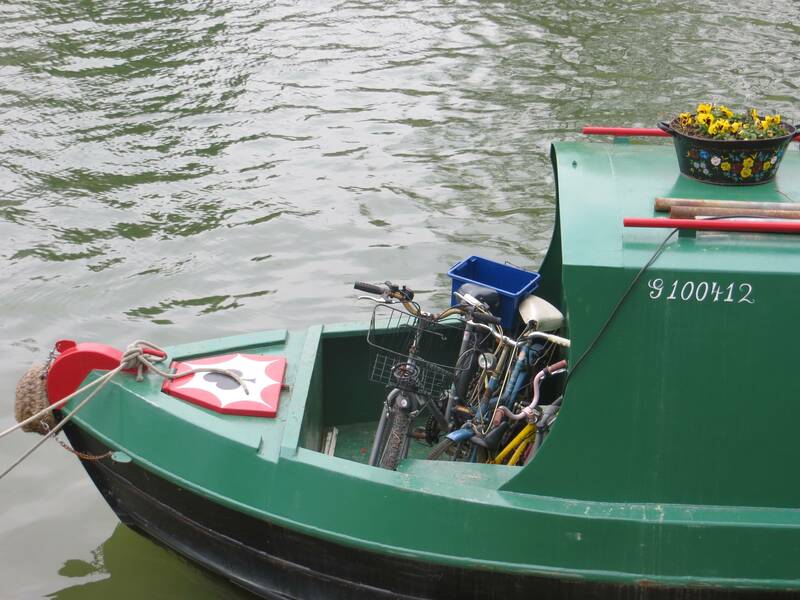 The dozen or so canal boats moored alongside the river hinted at a completely different side to Cambridge – a more ethnic, alternative and ‘green’ character that has long been alive in the city alongside the academia. 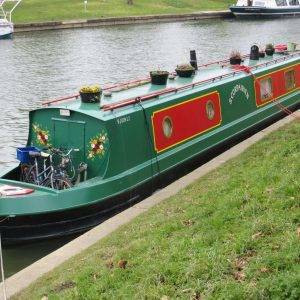 Canal boats are the model of space efficiency – kitchen, bathroom, living and sleeping areas all within a 40 sq ms space. 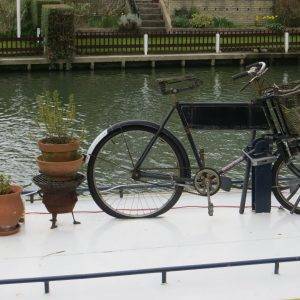 And on the roofs, bikes, firewood, herbs, flowers, vegetable plots, even a doghouse. Midsummer Common is host to Cambridge’s plushest restaurant – the two-starred Michelin Midsummer House, full of well-heeled regulars and hoi poloi on very special occasions; but also to its most ethnic and alternative Fair, the Strawberry Fair, held every June, a mix of outlandish clothes, vegetarian food, exotic smells and alternative music, organised ‘by the people of Cambridge, for the people of Cambridge’. 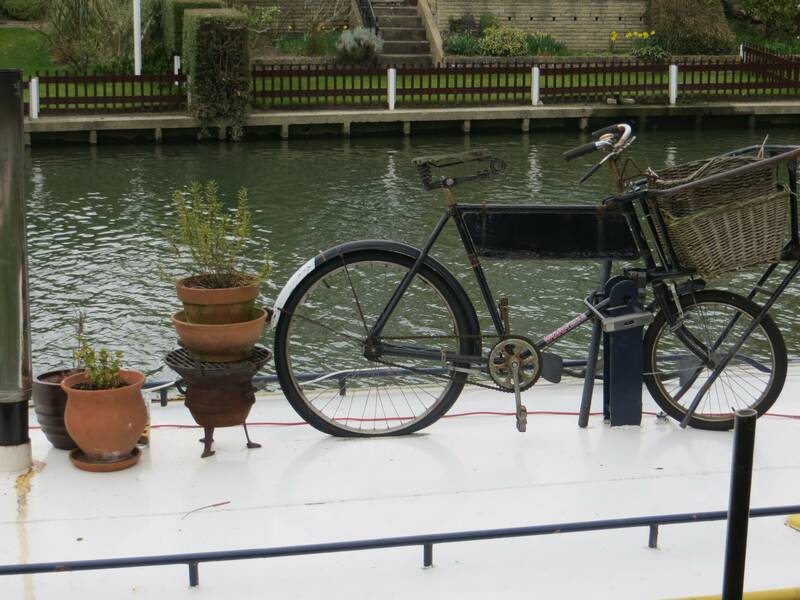 It’s this mix of life that makes Cambridge such a special city. And the common is still used for grazing cows too, so just check out the ground first if you plan to have a picnic here. 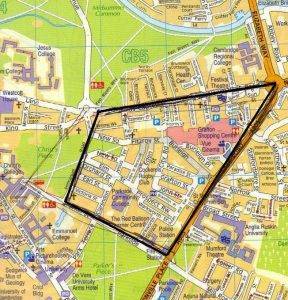 To our south is The Kite Area of Cambridge (the clue’s in the shape), bounded by East Road, Newmarket Road, Maids Causeway, Short Street, Emmanuel Road, Parker Street and Parkside. The area had a very distinctive character until it was torn apart in the early 80s in favour of the Grafton Shopping Centre. This ripped the community heart out of the area and destroyed a lot of terraced housing, shops and popular meeting places. Belatedly, the City Council is trying to restore the area with the help of English Heritage – much of it is now a conservation area. 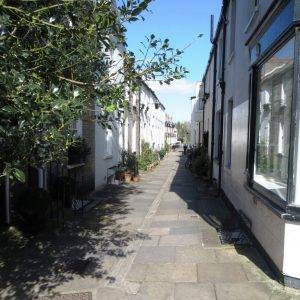 Take a look at Ian Kitching’s brilliant piece on the area. 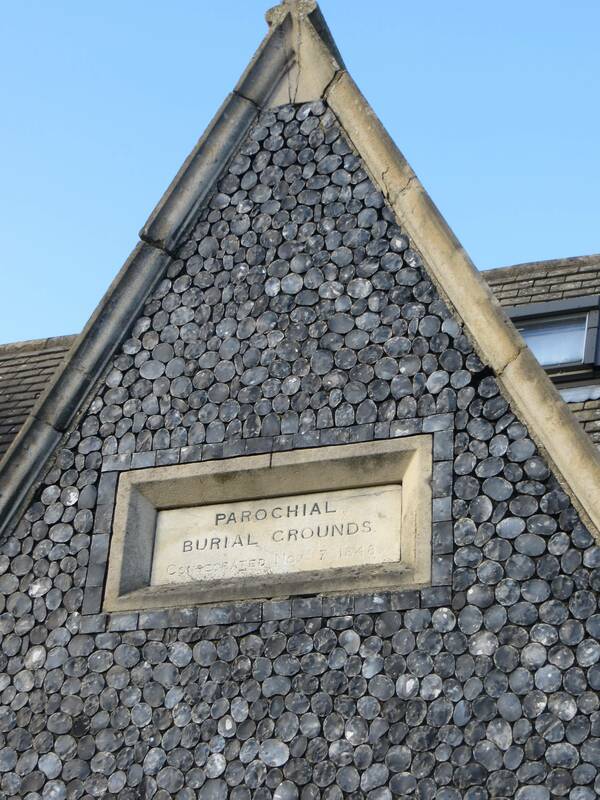 By the early years of the 19th century, overcrowded parish churchyards had become a serious problem in Cambridge, as they had in most UK cities, and a new burial ground outside the town was needed. 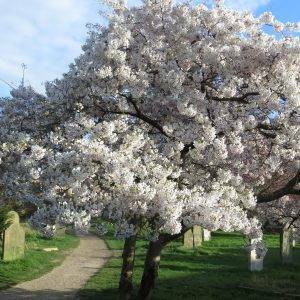 Mill Road Cemetery was built in the 1840s when it was still agricultural land on the edge of the town. 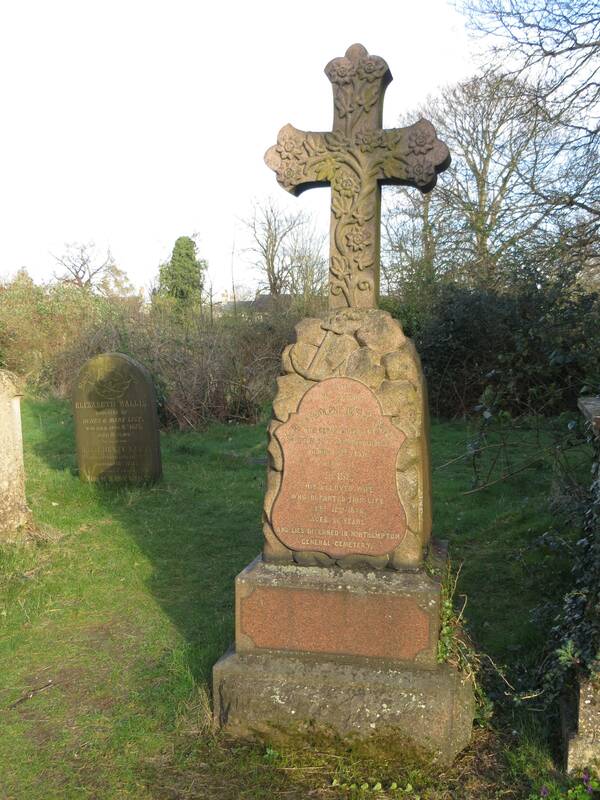 One of the most influential designers of the period was John Claudius Loudon, who laid out Cambridge’s nearby Histon Road Cemetery in 1842. He believed everyone should have access to green ‘breathing spaces’ within towns, and his vision was that well-planned and well-managed cemeteries, once full, could become the public gardens of the future. Which is pretty much how this cemetery works today, in a slightly run-down but charming way. In his 1843 book, ‘On the Laying Out, Planting and Managing of Cemeteries’, Loudon set out practical design ideas for urban cemeteries and churchyards. He suggested that, from a central church or chapel, small paths should radiate out to a serpentine perimeter path that takes visitors around the outer graves. 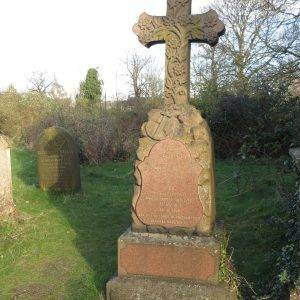 His popular and well-received ideas clearly influenced Andrew Murray, the designer of the Mill Rd cemetery. Most of the 3,500 headstones in the cemetery are simple monuments, though a few are highly ornamental, with fine sculpture and statuary. 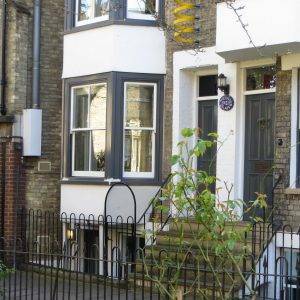 Nine are listed Grade II, of historical or architectural importance. 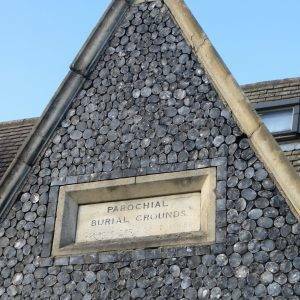 Several of Cambridge’s most renowned Victorian residents (typically ‘town’ rather than ‘gown’ folk) are buried here, including shopkeeper Robert Sayle (which became John Lewis Cambridge) and wood and stone carver James Rattee. There are many interesting inscriptions to set your mind wandering back in time; here’s just one: ‘In Memory of James Reynolds, many years driver of the Telegraph Coach from Cambridge to London, who died the 24th day of March 1868 aged 73 years.’ We paused a while in the cemetery, an oasis of calm and nature in the bustling city. 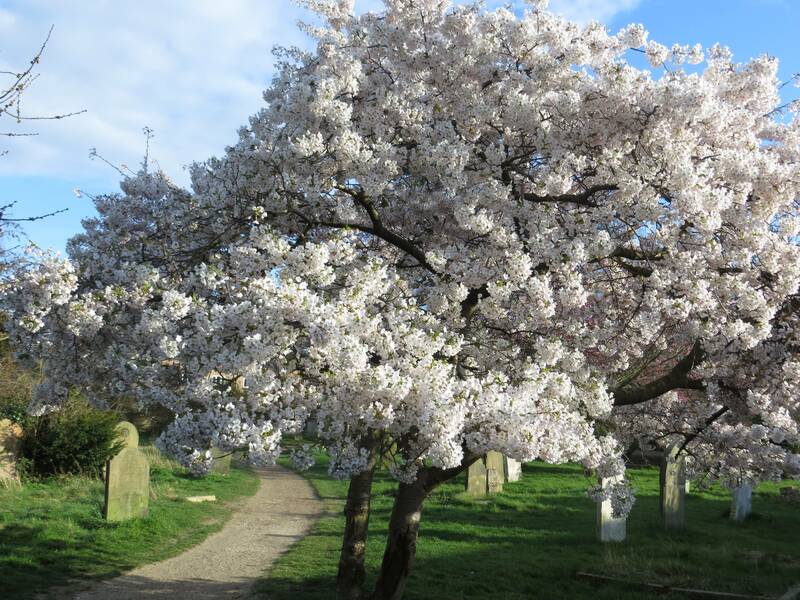 The weather was gorgeous, the birds were singing, orange-tip butterflies were flitting from grave to grave and there was a profusion of wild flowers and many different types of trees. “Did you say you knew a pub around here?” Mark suddenly chirped up from behind a tombstone; so back we went to my old haunt, the Alexandra Arms, to reflect on our day so far. Mark, who as well as being a prog rocker and ornithologist was also the Editor of Country Walking Magazine and, consequently, lover of all things green, was enjoying himself. “Sometimes it’s so good,” he reflected, “not having to worry about any gradients, being able to get a refreshment any time you want and there being so much to see, especially the architecture and all sorts of people getting up to all sorts of things. And we’ve hardly had to cross a busy road all day. You often forget you’re in a city at all.” Was the beer talking!? Refreshment break over, we walked along a delightful tree-lined avenue back into the bustle of the multi-ethnic Mill Rd (a million miles from the mood of Great Court, but with much better catering options) and thence to Parker’s Piece (10 hectares, 25 acres). Now, although in many ways this large open space looks unremarkable, prairie-like even, it played a key role in our footballing history. In the early 19th century, village football teams would arrive brandishing rival rules to the game, which they each affixed to a nearby tree, and got down to sporting business, usually involving large doses of roughness and certainly very little passing of the ball. But over time, maybe as injuries and argument mounted, a common set of football rules emerged, emphasising skill above force, which forbade catching the ball and the ‘hacking’ that had up until then been the norm. These ‘Cambridge Rules’ eventually became the cornerstone of the 1863 Football Association rules. Today, as we sauntered by, there was a (gentle) five-a-side game of football taking place and a (far-from-gentle) game of French cricket in progress. Now that’s a game that could do with some proper rules! We moved on now to the last part of our journey and the bit that most people will know least about. At the end of Lensfield Rd, you can’t miss Hobson’s Conduit, marked by a Tudor Fountain that was originally in the Market Square but moved here in 1856. Thomas Hobson is well-known in Cambridge for his conduit; but his claim to everlasting fame is the phrase ‘Hobson’s Choice’, which of course means no real choice at all. He kept a stable of horses which he would hire out in strict rotation, the customer having to accept whichever horse he was offered, or none at all! Hence the phrase was born. 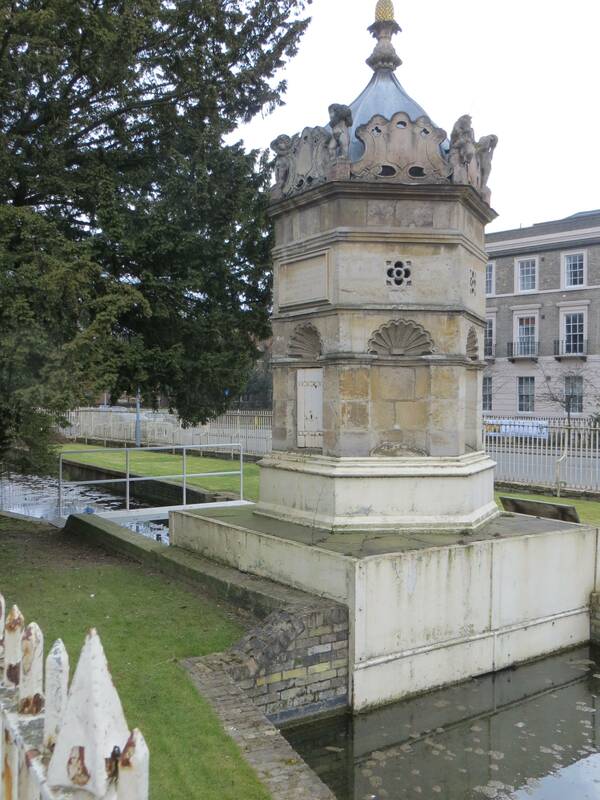 In 1610, Hobson helped finance the building of a conduit to convey fresh water to the centre of Cambridge from the springs in Nine Wells, near Trumpington, no doubt for the benefit of his trusty steeds. 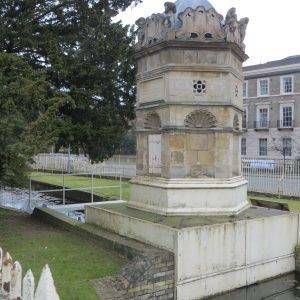 It is still very much in evidence today; in ‘runnels’ alongside Trumpington St, past the Fitzwilliam Museum; and in the southerly direction (which we are taking) pretty much in its original state, a wide and shallow stream. The original Botanic Garden of Cambridge University was founded in 1762 in the centre of the City, now the New Museums Site. It was conceived as a typical Renaissance physic garden, inspired by the Chelsea Physic Garden in London. It grew herbaceous plants used in the teaching of medical students at the University. Today’s much larger Botanic Garden (16 hectares, 40 acres) was founded in 1846 by John Stevens Henslow, Professor of Botany at Cambridge. He laid out the Garden to accommodate an extensive tree collection. But he also started to develop ideas about variation and the nature of species that would be taken up in a revolutionary fashion by his famous student, Charles Darwin, who was also a visitor to the Gardens. The plant collections were so appealing to Victorian collectors that visitors were required to doff their hats on departure to prove that they weren’t hiding away any rare cuttings. Today it is a thriving place for both learning and leisure; during the working day, enjoyed by mums with pre-school kids delighting in the natural abundance of the setting; and by knowledgeable older folk having a coffee and talking about flowers in Latin. The extensive Glasshouse Range would be a real refuge on a cold day. We took a coffee in the modern, airy café. Unusually, Google Street View got out of their car and walked around the garden, it’s worth taking a look at that too before you visit. South of the Botanic Gardens, the conduit becomes a much narrower stream, passing through the pretty Empty Common Allotments. 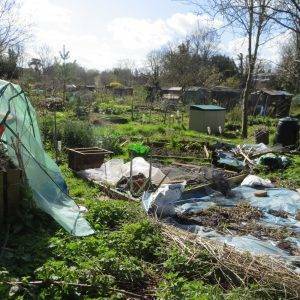 There are 47 ‘ten-rod’ allotments for rent in total from the council. A rod is an old measurement dating back to Anglo-Saxon times; and ten rods (250 square metres, about the size of a doubles tennis court) is judged to be the area required to feed a large family. The day we passed through there was plenty of activity; and the allotment holders seemed to be roughly split between the ‘flat cap’ brigade, escaping from household chores presumably, growing mainly traditional root vegetables; and the younger ‘urban farmer’ brigade, in ethnic-style dress, intent on growing more challenging crops – think herbs, salads, exotic vegetables, flowers; and a neatly arranged stack of rotting logs so that their little Oscars and Poppys can hunt for wildlife and learn about the countryside. 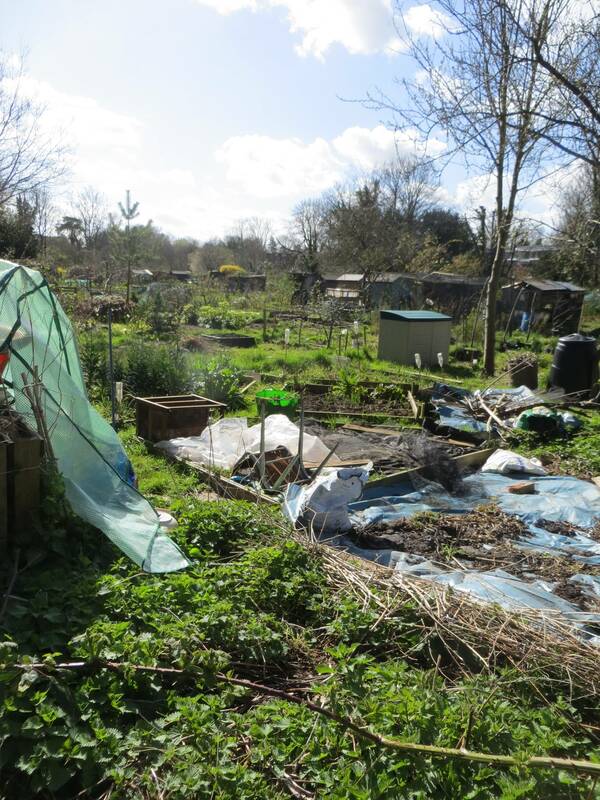 After years of decline, allotments are back in fashion, at least in Cambridge. 50 plots were added to this site in 2012, and there are still nearly 300 people on the council’s waiting list. At the far end of the allotments, take a detour through the tiny Clare Woods, supposedly a favoured habitat for bats – you will feel you are deep in the countryside! Then alongside the Guided Busway, past the massive structure of Addenbrooke’s Hospital. Founded in 1766, relocated here in the 60s from its original Trumpington St site (now the Business School), and progressively expanding to campus-style proportions today, it is undoubtedly the biggest architectural structure that we have seen today; a centre of medical excellence and monument to our massive health budget. And sadly, a complete mishmash of nothing very particular in terms of architectural styles. 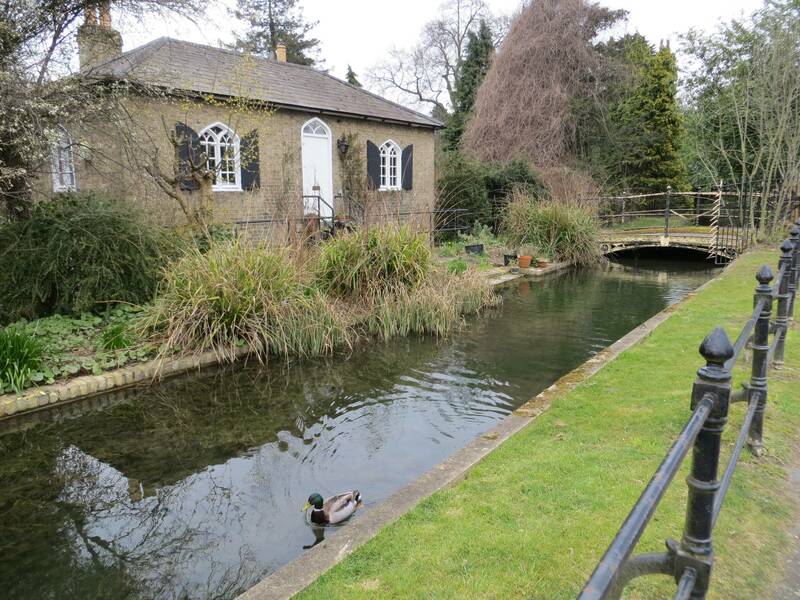 Finally, we cut through a residential part of Grantchester village, taking a detour to Byron’s Pool (well worth it if you still have the energy left). Today it is a nature reserve; once it was the spot where Lord Byron regularly took a swim (we know not if the bear came too). We resisted the temptation. 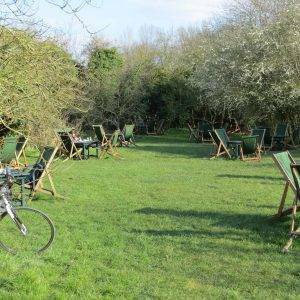 Then hopefully you will be back in time for tea and a large slice of cake at The Grantchester Orchard Tea-Rooms and a chance to expand your mind as well as your tummy through learned debate. Take a right and an immediate left at the war memorial down Church Lane, and then follow the Grantchester Rd. Just before the Cam there is a very worthwhile excursion to Byron’s Pool nature reserve. 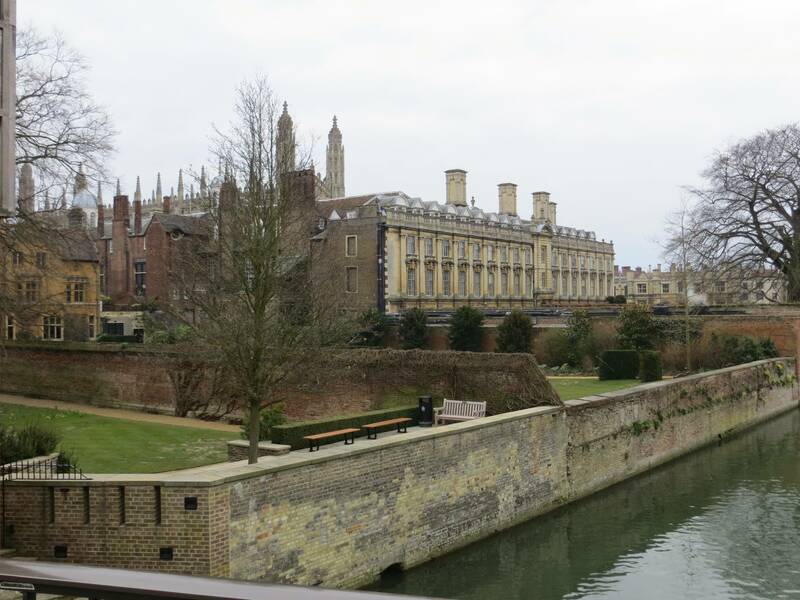 Re-joining the road, you cross a bridge over the Cam and then another across the millstream. Follow the footpath immediately to your right, which re-joins the road just a few yards short of your start-point. Grantchester Tea Rooms, 43 Mill Way, Grantchester, CB3 9ND (Tel: 01223 551125, www.orchard-grantchester.com). Faded splendour, but unbeatable on a sunny day when you can sit out in the orchard on deckchairs reciting your favourite poem. Café on the Round, 16 Round Church St, CB5 8AD (Tel: 07970 507488) A great little ‘indie’, serving freshly made coffee, baguettes, ciabatta, salsa & wraps, salads, cakes and pastries. Fitzbillies Cakes and Café , 51-52 Trumpington St, CB2 1RG (Tel: 01223 352500, www.fitzbillies.com) It’s been around forever and under new ownership now also offers lunch and dinner. But the main purpose of your visit still has to be to buy one of their Chelsea Buns, which are as outrageously sticky and indulgent as they have always been. Cambridge Botanic Garden Café Has a modern feel about it and great outdoor space. Food is good, interesting and freshly prepared. Recommended for tea. Nord Design, 5-7 Sussex St, CB1 1PA. Scandinavian design shop. Open Air, 11 Green St, CB2 3JU. Just in case you need stouter boots after all, or it’s drizzling and you need a waterproof. The Cambridge Toy Shop, 15/16 Sussex St, CB1 1 PA. The ultimate independent toy shop. A reward perhaps for your little one completing the walk? Providence, 72 Bridge St, CB2 1UR. Furniture and soft furnishings for the home. 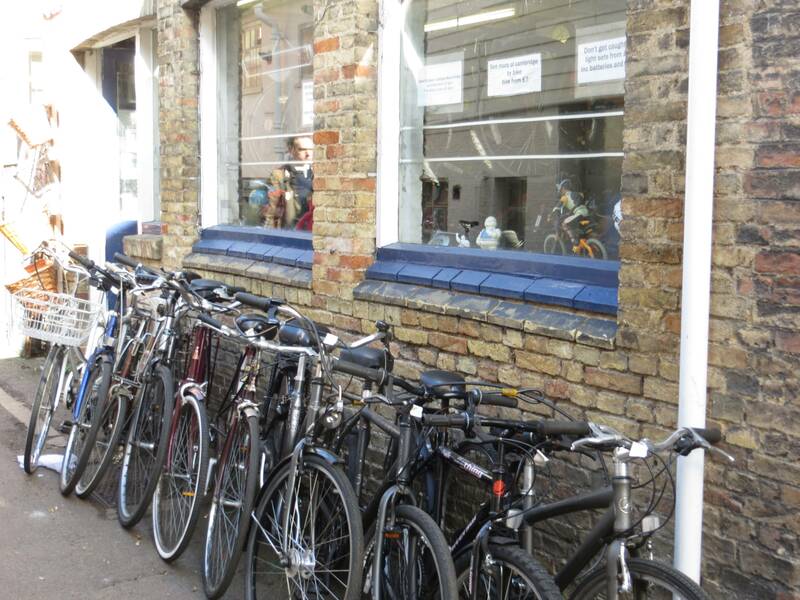 Cambridge Contemporary Art, 6 Trinity St, CB2 1SU. Prints, painting, sculptures, cards. 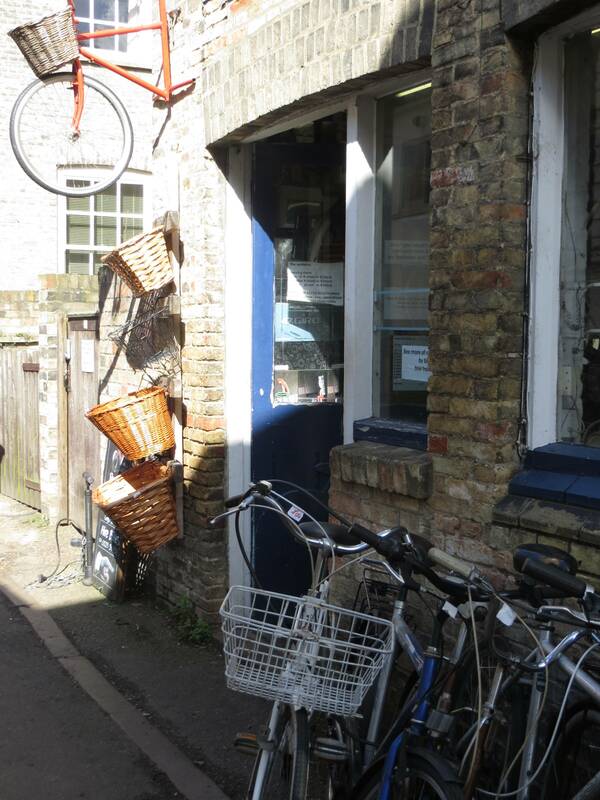 There is an excellent guide called ‘Independent Cambridge’ which is full of quirky indies. You will be able to pick one up in Heffers in Trinity Street or order online. The colleges Several are on the route, but they usually charge an admission fee. If you choose to visit Trinity, an added attraction is the Wren Library, which houses many historical manuscripts, including the 14th century Piers Plowman. Kettle’s Yard , Castle Street, CB3 0AQ (Tel: 01223 748100, www.kettlesyard.co.uk) is a quirky, must visit art gallery, just over the bridge beyond Magdalene. Fitzwilliam Museum, Trumpington St, CB2 1RB (Tel: 01223 332900, www.fitzmuseum.cam.ac.uk) just a few yards up from Hobson’s Conduit, has a classic mix of art and antiquities from all periods. Cambridge University Botanic Garden (1 Brookside, Cambridge CB2 1JE Tel: 01223 336265) An oasis of nature and calm, with glasshouses and beautiful lawns, rare plants and specimen trees. Take a modern architecture walk: The many post-1945 buildings are superbly reviewed at www.cambridgemodernarchitecture.org.uk. There are four recommended modern architectural walks. 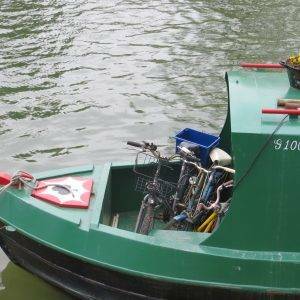 Try punting: Hire one for Trinity College Punts, entry via Garret Hostel Lane. 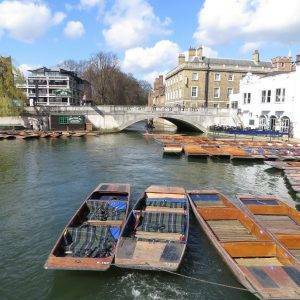 The names of Trinity’s punts are quite interesting: French Hen’, ‘Musketeer’, ‘Wise man’, ‘Hat trick’, ‘Harry Lime’, ‘Menage’…Just as the word ‘Trinity’ is associated with the number three, so are the names of its punts.